Moving Forward on Healthcare Reform: Single payer? It is frequently stated that the current Republican Congress is ineffective in getting anything done. That is not entirely true. A big issue was decided this past summer. The failure of Congress to repeal and/or replace the Affordable Care Act means that the goal of universal healthcare for all Americans is here to stay. At least three states, Vermont, Colorado and California have recently rejected state-wide single-payer plans because of the huge costs involved. 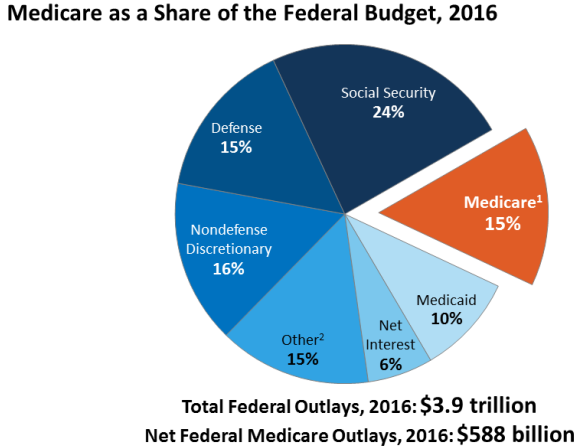 The Urban Institute estimates that Medicare for All would increase federal spending by $32 trillion for the first ten years (compared to a very high current total national debt of $20 trillion). Medicare is an inefficient hidebound system with over 140,000 procedure codes where private sector cost-saving measures, like competitive bidding for routine services, are rarely used. There are now 155 million Americans who receive and like their employer provided health insurance and who will resist moving to a Medicare for All plan especially at the cost of a huge tax increase. On the other hand the cost of healthcare in the U.S., public and private, now eats up 18% of GDP, almost twice as much as for any other developed country, and major changes need to be made to give individuals more direct responsibility for the cost of their own healthcare. One attractive alternative is to limit the tax deduction for employer provided care to the cost of catastrophic coverage, at a cost of about $3000 per person per year. It could be made progressive by tying deductibles to income. Conclusion. 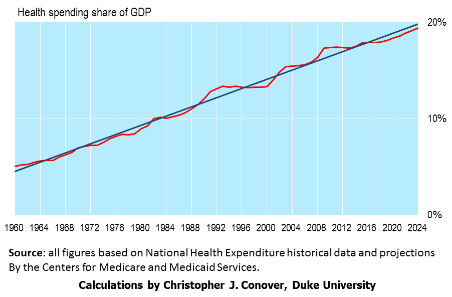 Healthcare spending in the U.S. is way too high and something major needs to be done. 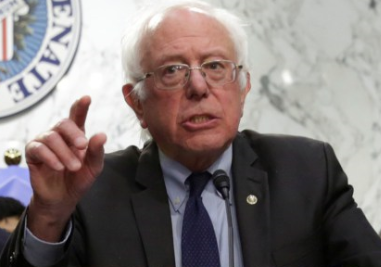 Universal catastrophic care for all Americans not already covered by Medicare and Medicaid is an attractive alternative to single-payer Medicare for All. This blog is devoted to fiscal and economic issues facing the U.S. Both the Trump Administration and the Democrats are working to speed up economic growth and I believe there is a good chance that this will happen. 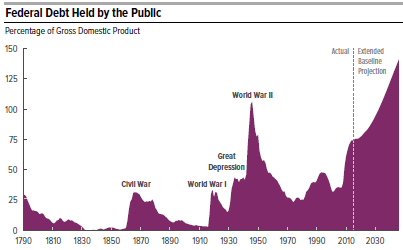 However there is not nearly enough interest in addressing an even bigger problem: our national debt, is now larger, in relative terms, than at any time since the end of WWII. This is a very difficult political problem because elected representatives would much rather say yes than say no to new programs and more spending. 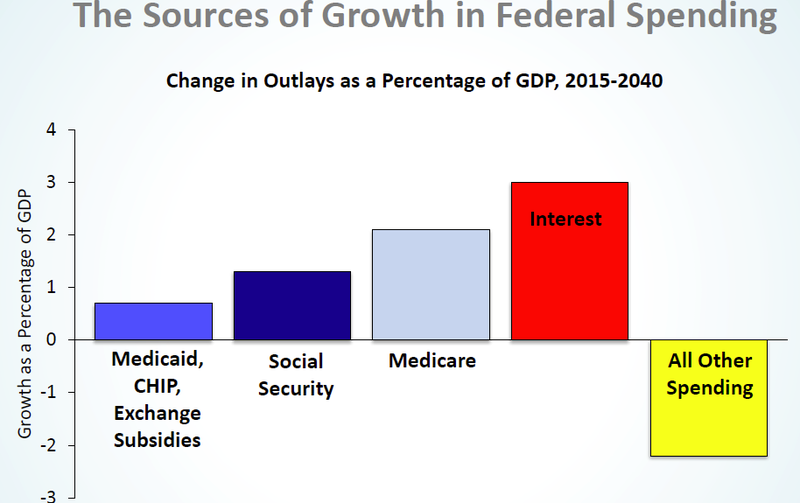 It is even more difficult to try to restrain the growth of, let alone cut, existing programs. Eliminate concurrent receipt of retirement pay and disability $139 billion for veterans. Increase premiums for Medicare Parts B and D from 25% to $331 billion 35% of cost. Conclusion. This brief list of budget restraints would reduce deficit spending by about $160 billion per year. This is significant but not nearly enough compared to the projected deficit of $685 billion for just the 2017 fiscal year alone. 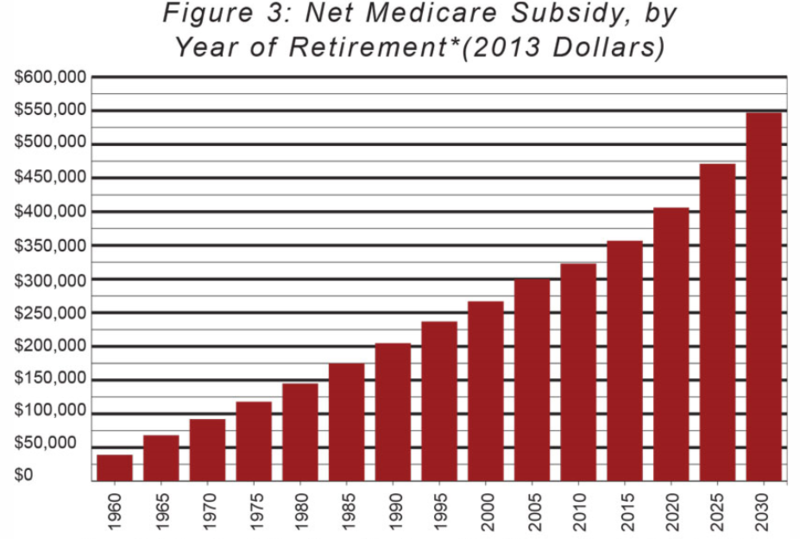 About 2/3 of the savings come from the two entitlement programs of Medicare and Medicaid. The idea here is to give specific examples of the sort of changes which will be necessary to seriously confront our debt problem. I know that I repeat myself a lot. I am a fiscal conservative and social moderate. This puts me in the middle of the political spectrum from left to right. I support social welfare programs if they are legitimately helping the less fortunate among us. I am especially supportive of programs for African-Americans because of the racial bias they experience. Unfortunately our national leaders have collectively lost a sense of fiscal responsibility in recent years. Looking at the standard debt chart (above) produced by the Congressional Budget Office, it is clear that indifference to debt commenced under President Reagan and has waxed and waned ever since. The debt has been growing especially fast ever since the Great Recession in 2008 and now stands at 77% of GDP, the highest since the end of WWII. Shrinking the debt (as a percentage of GDP) is now America’s most urgent problem. 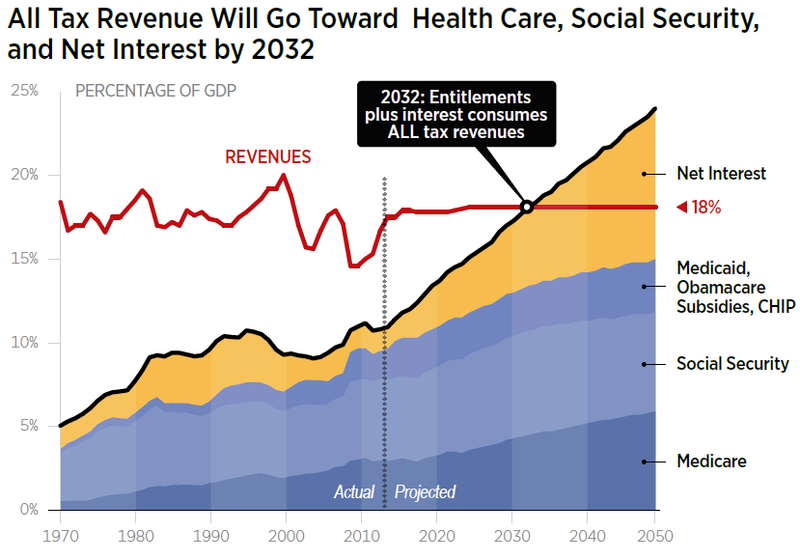 As I have discussed before, it is the entitlement programs of Social Security, Medicare and Medicaid, as well as interest payments on our increasing debt which will continue to worsen the debt problem in the coming years without strong corrective action. All entitlement programs need to be reformed to impose cost control. Right now the two healthcare bills in Congress propose that the funding mechanism for Medicaid be changed so that it will be on a fixed (federal) budget from now on, rather than be continued in its current open-ended form. Medicare is an even more expensive program than Medicaid. It would be better to fix both of these programs at the same time, but it is better to fix Medicaid alone than to do nothing at all. It would be even better to replace our employer provided healthcare system with a uniform, but limited, health insurance tax credit for all (including for the self-employed) and to make all of these major changes at the same time. This would be the fairest way to proceed. Conclusion. The current GOP plan to curtail healthcare costs could be much improved. It is only a small step in the right direction.